Several of us, including a well-known arts administrator, arrived late for this excellent performance of Bach’s Christmas Oratorio. Originally scheduled to begin at 7.30 pm, the starting time had been brought forward by half an hour. In spite of admirable efforts by The Barbican’s administration, some of us got caught! Late arrival taught me two valuable lessons. One is obvious: always check and re-check starting times, especially in the cases of long concert programmes, which this was bound to be! My other discovery was both amazing and inspiring. 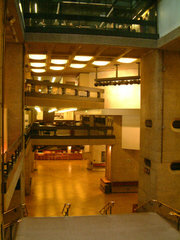 Latecomers can watch concerts on a large TV screen with acceptable sound in the foyer (pictured); picture and sound are better than on many home TV sets. Yet I was the only one of the latecomers to bother with this facility: indeed, next to me on the TV bench was a middle aged couple, deep in conversation! I would have liked them to go somewhere else but they took no notice of me, nor - more to the point - of the wonderful music coming from the screen. Yet they had come to attend this concert!